The Riverton High School Percussion Studio has a long standing tradition of excellence. The Percussion Studio has qualified for the state Solo and Ensemble festival 7 out of the last 7 years, earned a marching band 4A Percussion Title in 2016, placed 3rd in the Utah Percussive Arts Society (PAS) Day of Percussion in the Intermediate Category in 2018, and 3rd in the Utah PAS Day of Percussion Advanced Category in 2019. Riverton is proud of having one of the largest percussion studios in the state with over 45 members over three leveled courses. 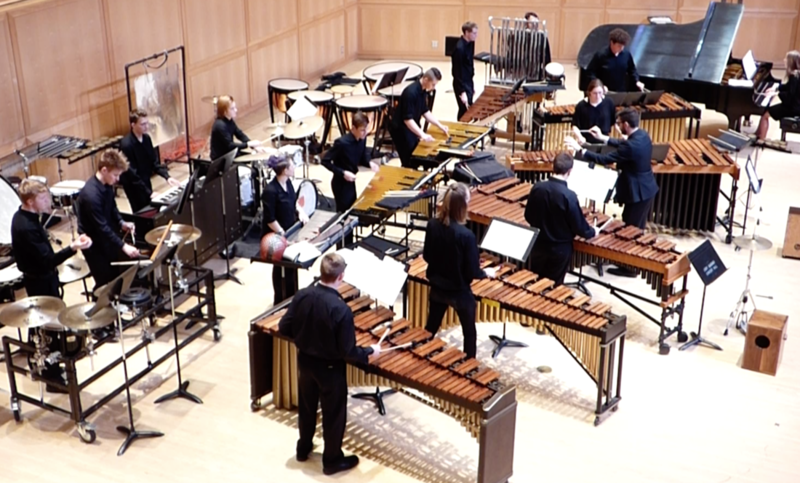 This ensemble is a Sophomore course designed for all students with limited experience and students who have taken Percussion at the Jr. High Level. Students learn the fundamentals of snare drum, drum set, and marimba as well as preparing for 3-5 concerts a year. This is an open enrollment course with no audition or prerequisite required. A Junior level course designed for students who have completed Percussion 1 or are advanced Sophomores. Students will expand on fundamentals learned in Percussion 1 as well as participate in the Region Solo and Ensemble festival and Percussive Arts Society Day of Percussion. Students are also highly encouraged to take private lessons and participate in Marching Band in preparation for this course.